Buy a shirt as a member of our club or a supporter. 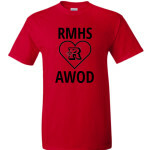 All proceeds go to the RMHS AWOD. These shirts are for members and supporters. All proceeds will support the endeavors and activities students create to promote inclusivity and acceptance in our community. Orders will ship within 10 business days of this fundraiser ending on 11/27.